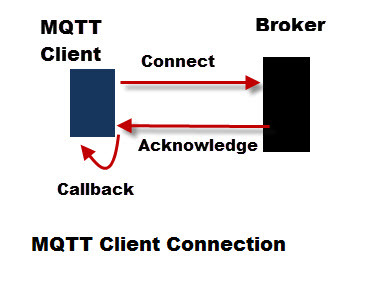 The MQTT client uses a TCP/IP connection to the broker. Once the connection is established the client can send data to the broker, and the broker can send data to the client as required. 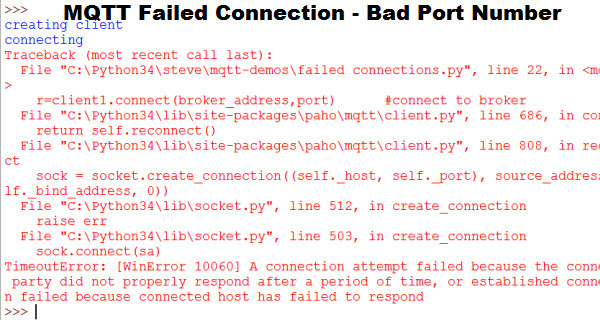 In this tutorial we will look at connecting to an MQTT broker using the paho python mqqt client. 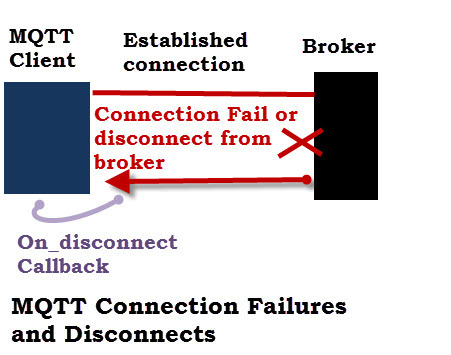 To establish a connection to an MQTT broker using the Python client you use the connect method of the client object. The only parameter you need to provide is the host name. This can be the IP address or domain name of the broker. The connect method is a blocking function which means that your script will stop while the connection is being established. Was The Connection Attempt Successful? When a client issues a connect request to a broker that request should receive an acknowledgment. The broker acknowledgement will generate a callback (on_connect). If you want to be sure that the connection attempt was successful then you will need to setup a function to handle this callback before you create the connection. The function should receive 4 parameters, and can be called anything you want. I have called mine on_connect(). The client is a client object. rc (return code) is used for checking that the connection was established. (see below). Flags and userdata aren’t normally used .The full documentation is here. To process the callback you will need to run a loop. (see understanding the network loop) . Therefore the script generally looks like this. Because the callback function is asynchronous you don’t know when it will be triggered. What is sure however is that there is a time delay between the connection being created, and the callback being triggered. It is important that your script doesn’t proceed until the connection has been established. For quick demo scripts I use time.sleep() to wait, and give the connection time to be established. However for working scripts I process the callback and use it to flag a successful or unsuccessful connection. To get better control of the connection I use a flag in the on_connect callback. The flag I create as part of the client object so it is available throughout the script. At the start of the script I set this flag (connected_flag) to False and toggle it to True when the Connection is successful, and back to False when we get a disconnect. We can now use this flag to create a wait loop. Incorrect client settings e.g. bad password.. It is important that these are detected and handled by the connection script. We are going to look at a few of these and modify our connection code to detect them. Note: For these examples I will use the Paho MQTT client and the Mosquitto broker. Trying to connect to a broker using a bad IP address or port number will generate a socket error, and raise an exception. So the first screen shot shows the result of using bad port number. To determine if the connection was successful we need to examine the return code of the on_connect callback. A return code of 0 is successful, whereas other values indicate a failure. In the example below we will try to connect to a broker without providing the required authentication. Notice the connection fails and returns a return code of 5 which indicates authentication failure. You should also notice that because I am using the loop_start() function the client will try to reconnect, but this is pointless as the result will be the same. We can stop the loop in the on_connect callback. However to stop the main script we need to set a flag that we can use to exit. I prefer to use a flag and stop the loop as part of the main script. Here is the main script modifications to quit. If the broker requires username and password authentication (see Mosquitto username and password authentication ) then you need to set this before connecting. Normally the python client will connect using MQTT but it can also connect using MQTT over websockets. You will also need to change the port..Websockets generally uses port 9001. A client can disconnect gracefully, if it has no more data to send by sending a disconnect message. The Paho client provides the disconnect method for this. It can also get disconnected due to a bad network connection. If the connection fails for some reason then you will need to decide whether or not you should try to reconnect. A disconnect triggers the on_disconnect callback which you will need to examine. You can see that I simply log it, and then set flags that can be used by the main program to detect the disconnect. Note: You will need to be calling, or running a loop to trigger the callback. Generally you will need to reconnect as soon as possible. If you run a network loop using loop_start() or loop_forever() then re-connections are automatically handled for you. A new connection attempt is made automatically in the background every 3 to 6 seconds. If you call the loop() function manually then you will need to handle the re-connection attempts yourself. See understanding the loop. You can do this by using a connection flag that is toggled by the on_connect and on_disconnect callbacks. Taking into account the above our client connection code should. If connection status is bad attempt retry and or quit. 1 .Not seeing any messages or not seeing all expected messages. The callback functions are async functions which can be called at any time. Use a queue to store the messages and print in one place. I’ve created a video that covers all of the above you can see it here. but i am getting n output.could you please tell me why. Thank you for your website. I have a python script running that checks for a csv file, connects to the broker, then sends the file, then disconnects from the program. 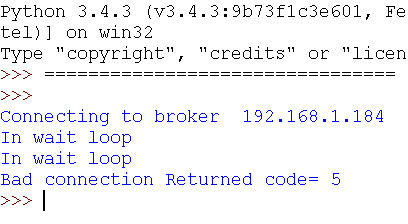 My problem is that when the next file comes in it detects the file, detected that the broker is disconnected, attempts to connect with the same connect line of code, but I never get an on_connect call back and so it does not publish. I think the problem is that even though I get an on_disconnect call back it is not fully disconnected and therefore it won’t make a second connection. If I stop and restart the script it works the first time and disconnects but wont reconnect and publish. I searched in my python 3.7 directory and couldn’t find any trace of ‘paho’. I’ve read, that it’s a library, which may be imported or installed, but I don’t know how to acquire it. I want to export data from MQTT spy into excel on windows. I have a machine, which sends it’s data to the broker. From there I’d like to acquire data for example the current and gather it in an excel sheet for predictive maintenance usage. Do you have any tips for me – that’d be so awesome. The data logger relies on the Python client. Here are the install instructions. With mqtt spy I’m not sire how you would get the data into excel as it send data to the cosnole. The data logger will put the data into a file and can easily be imported into excel. Lt me know how you get on. My application had problem: many close_wait on gunicorn and python worker when i publish to mobile (i tried both method: client.publish or publish.single). Note: my application sent many messages. 2. i used client.publish or try with publish.single for send message to channel. But it’s same. many close_wait on my application. Thanks Steve for the fast reply. Hi, I like the tutorial. I am struggling though with a publish quirk. I have a python script (running under piCore on a Raspberry) calling AWS IOT successfully all the time. However once the script has connected successfully and then I force a network error by taking down my router and the script publishes another message it just goes through as though all was well with a good return code. 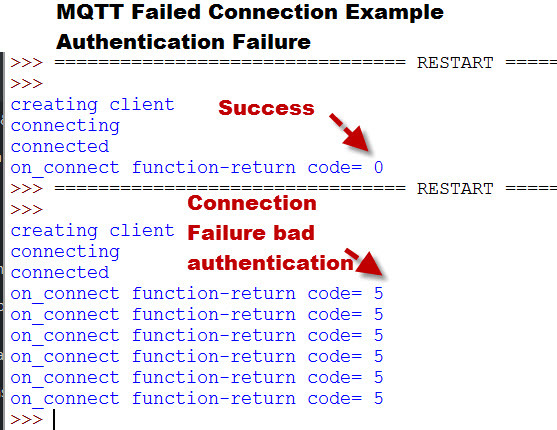 I do understand that QOS 0 fires and forgets but I am surprised that MQTT doesn’t check that the session is valid. Is that how it operates? Yes the client hasn’t detected a problem and so it just tries to publish the message. If you use QOS 1 then it will resend the message because it didn’t get a PUBACK. Hi Steve, excellent article. 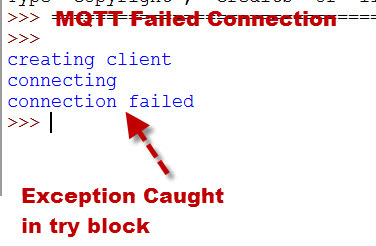 I’m using Paho to connect to my local Mosquitto Broker, however, in my on_disconnect callback, I’m receiving Out of Memory error all the time. It disconnects and the reconnects forever always receiving this message. Have you faced this problem? Not seen out of memory error. I have seen rapid connect and disconnect. Check that another client isn’t using the same client name. Delay starting the loop until after you try to connect and see if that solves it. I will now try to subscribe to MQTT, in order to receive data that already is in move. I will inform you, if something goes wrong. Thanks again, for your immediate support. Hello Steve and thanks for your great articles. Reading your article, this RC(=5) means “Authentication Problem Failure”. Installing MQTT Broker in my PC, i used authentication privileges, creating username(s) & password(s). ,i can set a username and (optionally) a password for broker authentication. Have you ever use it before? Could you give me any tip about the code line that has to be added, in order to be succeded, authentication? Thanks about the immediate reply steve! I have to add this code line both in subscribe and line code, right? You have to add it before the client connects. If you use the same client to subscribe and publish then you only need it once. I’ve been struggling to find a real client connection status tool, dashboard or anything which will show a list of my clients and their connection status. Clearly the broker via the low-level protocol mechanics maintain an MQTT keepalive table for each client — that’s how Last Will and Testament (LWT) is triggered internally by the broker. However how does one display such table? It seems such need would be essential but I can’t find anything close to it. Everyone refers to the payload as means to track “active” clients but a client can be silent for days yet maintain a connection to the broker and that is only detectable by the broker’s internal keepalive timer and table. hey nice tutorial. I would like put forward a question which I came across while working with mqtt. I am running the client program and connecting to the broker running in the same pc using the connect() function and starting the loop using the loop_start(). Now I want to disconnect from the broker,so am using disconnect() function, but I see that I am still connected to broker. Can you help me resolve this problem. How do you know that you are still connected? Can you see the broker console screen? After you disconnect you should then stop the loop using loop_stop. However the loop shouldn’t reconnect you as the disconnect was not an error e.g network failure. If you send me a copy of the script you are using I can take a look. Thank you very much Mr Cope. Hi, Steve. Do you have any tutorial for the keep alive time? I read through the documentation on HiveMQ and understand the keep alive interval, PINGREQ and PINGRESP but i’m not sure how are we going to test whether the client(both publisher and subscriber) will be disconnected if one of them didn’t reply with the PINGRESP and PINGREQ.